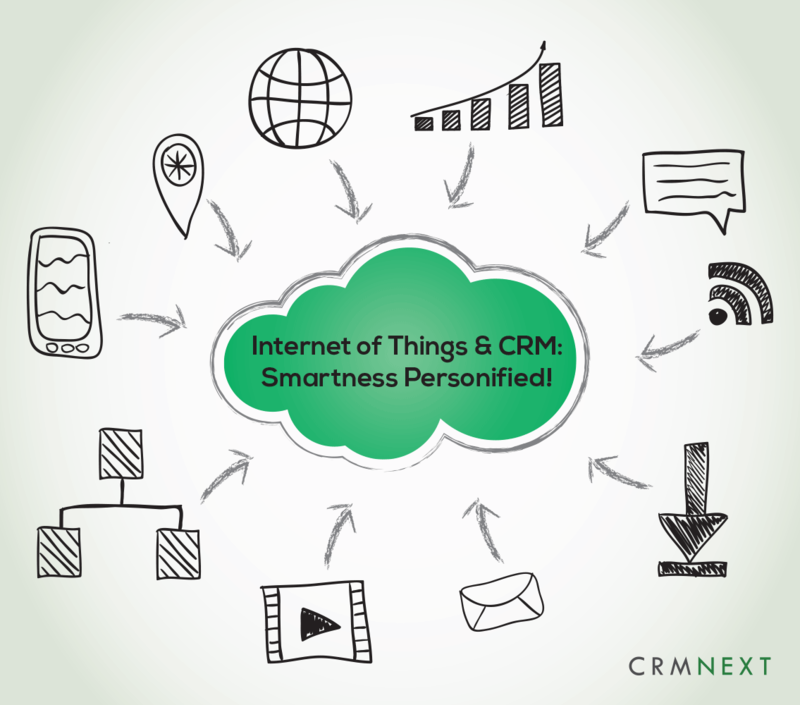 The Best CRM Blog: Internet of Things & CRM : Smartness Personified! Internet of Things & CRM : Smartness Personified! Imagine a life where everything would be accomplished through voice command or simple hand gesture. Where you would no longer need to carry ‘n’ number of electronic objects with us everywhere we go. Say, a street maintained only for joggers is installed with IoT devices on tree bark. Joggers won’t need to carry pedometers or watches with GPS to calculate the steps taken or distance traveled. The runner would just have to give a voice command, to start the calculation of the speed, stride of the users steps, and anywhere within the joggers park street, the user can voice command and ask for the result. Even better, where IoT devices are placed on any streets help you to direct to the destination if you are lost, just by invoking voice command. Closer home, your coffee turns on as soon the alarm rings early morning. When you return home after a tiring workday, the music system plays a relaxing tune, while dimming the lights for a soothing experience. Future? More like present with Amazon Echo, Google Next, DropCam and many more. (Google leads by pouring a staggering $6 billion dollars in acquisitions and research in 2015 alone). IOT makes our busy scheduled life much easier.It brings in another interactive dimension, the one with the machines. Each device interacts with multiple devices due to the sensors called Microelectromechanical System (MEMS) installed in them. These peripheral devices can be a sensor, actuators or drivers. The Embedded systems used to communicate with the system are either ipv4 or ipv6. For home appliances smart metering will suffice. 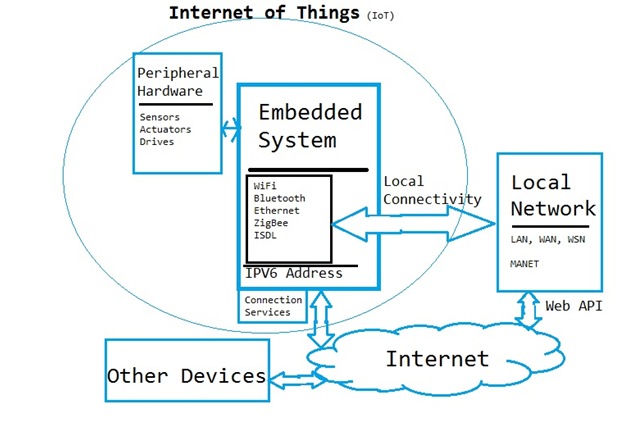 Communication (Input) which takes place with the help of ZigBee, WiFI, and Bluetooth. It squares down to Big Data. 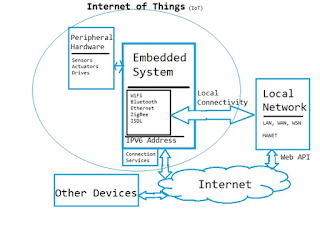 IoT is all about connecting devices with data interaction. . There are many application which solely depends on Big Data to fulfill requirements. The main aim is to make non internet application combine with internet to ease our life by the perfect marriage between Internet of Things and Big data. IoT devices would have a radio that can send and receive wireless communication; it uses less frequency or lower bandwidth Bluetooth. Some devices use Electrical systems using Mesh network making use of IPv4, IPv6, and lesser power requiring objects uses batteries. Sensors can be embedded outside your home, for instance, on vehicle parking or speed breakers. Sensors placed on street would give indication to the vehicle and directs the vehicle to the empty parking lot. Will CRM have a feature role? IoT can help companies fight off consumer indifference and embed more in their daily lives. With the pervasive use of devices like Amazon Echo, Next Fridges., IoT devices becomes immensely rich in customer data. Businesses can use this data to learn more about the customer preferences, daily habits and nudge them with buying recommendations with the help of CRM Solutions. With targeted sales and marketing campaigns run through Marketing CRM Solutions, they can become the gateways through which people can run their personal and professional lives with full efficiency. Most IoT devices are personal and durable. Businesses can take a shot at lodging themselves right at their customer’s home. What’s more personalized engagement than that? Annette Raju is part of Delivery Services Group at CRMNEXT. She takes maximum pride in delivering optimum product solutions to her client's requirements and writes about emerging technologies that disrupts the financial world.